On January 17, Mongolian Prime Minister Ukhnaagiin Khurelsukh concluded his three-day visit to South Korea. During his visit, Khurelsukh attended a Mongolian-South Korean business forum and exchanged views with South Korea’s leadership on wide-ranging cooperation and deepening bilateral relations. The prime minister’s South Korea trip strengthens the likelihood that the two countries will seek closer ties in terms of trade, labor and capital. Mongolia is highly reliant on trade with its neighboring economies, China and Russia in particular, so the country has been eager to boost trade with other countries, especially Japan and South Korea. At the business forum held in Seoul, Khurelsukh expressed strong expectations for an economic partnership agreement (EPA) with South Korea, which "will serve as a gateway for South Korea to make inroads into Central Asia and Europe while helping Mongolia advance into the Asia-Pacific region," according to South Korea’s Yonhap News Agency. Mongolia already signed a bilateral EPA with Japan in 2015, which has resulted in either reduction or removal of tariffs on most of the goods traded between the two nations since 2016. Against this backdrop, South Korea is widely expected to be the second country to sign an EPA with Mongolia. Finding ways to make it easier for Mongolians to work in South Korea was another focus of Khurelsukh’s trip to the country. Mongolians see South Korea not only as a major transfer hub to other Asia-Pacific countries and North American countries, but also as an important destination for overseas employment and study. Therefore, Mongolia has long placed an emphasis on helping its citizens to work and live in South Korea. 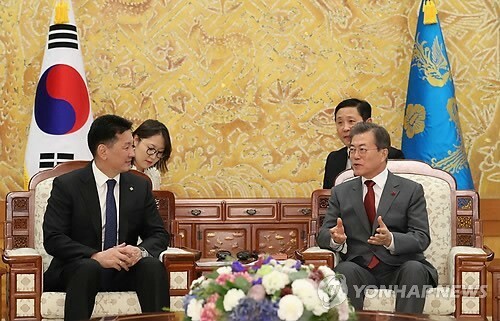 During Khurelsukh’s meeting with South Korean President Moon Jae-in, the two sides discussed future efforts on mutual visa-free travel, Mongolia’s state-owned news agency Montsame reported. The two countries also signed memorandums on cooperation over jobs. What gained the most attention from the outside world was Khurelsukh’s attendance at a meeting hosted by South Korea’s Minister of Employment and Labor Kim Young-joo. The South Korean ministry has plans to raise the quota of Mongolians working in South Korea, according to Montsame, and there is also a possibility for the establishment of a database connecting South Korean employers and Mongolian jobseekers to allow for increased work opportunities. It is anticipated that ensuring the rights of Mongolians working and studying in South Korea will become a component of bilateral relations over the long term and bilateral partnerships in this regard are also set to be a key aspect of closer ties between the two nations. On top of that, the Mongolian government has always attached great importance to capital cooperation with foreign governments and international financial institutions. Its economy is now in the midst of a recovery and preferential loans and non-reimbursable assistance from abroad are of particular significance for Mongolia’s domestic growth. The country was hoping for a loan agreement to be signed with South Korea and Khurelsukh’s trip made this a reality. The two countries signed a soft loan agreement worth $700 million, with an annualized interest rate of 0.2 percent, a 30-year repayment term and a 10-year moratorium. The Mongolian government intends to apportion $500 million of the total to the reduction of pollution. Mongolia and South Korea are likely to maintain this upward trend in bilateral economic and trade cooperation. Mongolia will also continue on its path to push for trade ties with other countries, while South Korea sees a strong complementarity in its trade with Mongolia, which is one of the world’s most active mining states. The farming and animal husbandry industries in Mongolia are also a magnet for South Korea, where there is very limited cultivatable land. In strategic terms, Mongolia can play a positive role in ensuring South Korea’s food and energy security. In addition, the country can serve as a bridge between Europe and Asia, which can facilitate South Korea’s exports to European and other Asian countries. This is partly why President Moon proposed upgrading the bilateral comprehensive partnership relations to a strategic partnership. Having said that, there are still challenges such as a lack of diversification of exports, and the relatively modest trade between the two countries, currently. It will require greater efforts from both countries to deal with these issues.